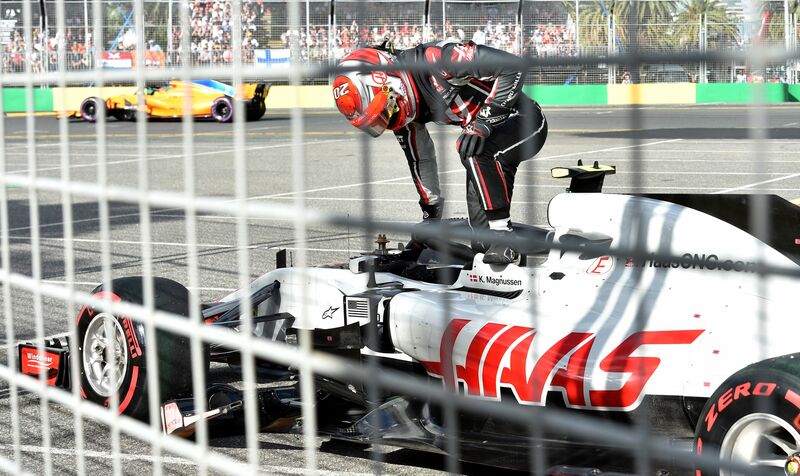 21 laps into the Australian Grand Prix, things were looking rosy for the American Haas outfit which was headed for its best-ever Formula 1 finish. Three laps later, it was heartbreak. Kevin Magnussen, who had been running in fourth ahead of Haas team-mate Romain Grosjean, had to pull over after his pit stop on lap 22. Grosjean parked it two laps later, following his own pit stop. Both cars retired with a loose wheel. "We don't yet know the cause", Grosjean told French tv-broadcaster Canal+. "We haven't seen any issues like this in winter-testing. We need to analyze what went wrong; whether it was something mechanical or human error." "If it's a human error, it's a human error. If it's something mechanical, we'll be making changes", said Grosjean, who was seen consoling Haas' mechanics in the paddock as the race raged on at the Albert Park Street Circuit. Haas' double DNF is a big blow for the team. Although tipped as a possible surprise package for 2018, with Haas underlining its potential as Magnussen and Grosjean qualified on the third row and ran competitively in the race, the expectation is the American team will be up against it in the development race this year. With bigger and richer teams such as McLaren and Renault expected to make significant headway through 2018, Haas has to take its chances whenever it can early in the season. "We lost maybe 22 points for the Constructors' Championship today", Grosjean remarked. "We're going to feel that." Kevin Magnussen retired from the race.Getty Images. Grosjean in the Haas VF-18.Getty Images. Haas finished the 2016 season, its first in Formula 1, eighth in the championship with 29 points. Although it racked up 47 points last year, the team once again came in eighth. In addition to the costly loss of points in the 2018 season-opener, Haas has been fined a little over $12,000 by Formula 1's governing body for releasing their cars from the pits in an unsafe condition. In the team's post-race press release, Grosjean did add that the performance before the retirement was very encouraging. "If we can repeat that performance over and over, we're going to forget this very quickly."